As soon as Vice Pres­ident Mike Pence dropped a “Make America Great Again” ref­erence during his com­mencement speech at Hillsdale College in May, I knew that inviting him was a mistake — not because of his office or char­acter, but because a grad­u­ation cer­emony is no place for political gain. The success of the Trump admin­is­tration had nothing to do with the accom­plish­ments of the grad­u­ating seniors. And I know I’m not the only Hillsdale student who felt that way. But a recent article in The Atlantic seems to suggest that those of us who dis­liked the selection of Pence are morally sep­arate from Hillsdale’s lead­ership, which is a mis­guided claim. “What’s an earnest young Hillsdale undergrad who is even pass­ingly familiar with Trump’s char­acter and past actions to make of Pence’s selection as com­mencement speaker, his speech, or his broader work trying to elevate, empower, and lav­ishly extol a fla­grantly immoral pres­ident?” Frieder­sdorf writes. Frieder­sdorf goes on to say that Pence is “engaged in a util­i­tarian moral com­promise, wherein he helps to secure great power for a morally odious man with the expec­tation that the man will wield power in ways that wind up ben­e­fiting the greater good.” Pence parades around the U.S. excusing the president’s morally vacant actions, and he did so once again at Hillsdale College in May, Frieder­sdorf says. Many Hillsdale stu­dents, myself included, were vocally critical of the college’s decision to invite Pence. I didn’t like that Hillsdale was aligning itself with a con­tro­versial admin­is­tration. Others just didn’t want a political figure speaking at com­mencement, regardless of his or her political party. But Frieder­sdorf makes no mention of this — because, though he makes many assump­tions about the Hillsdale student body in this piece, he doesn’t ref­erence a single Hillsdale student or faculty member to back up his claims. I can’t speak to his depth of research, but even if he did reach out to stu­dents and faculty members, the fact remains that his only Hillsdale voice in the piece is Arnn, in a radio interview tran­script. Although it’s respectful, the piece does seem to question an entire college’s moral direction based on a few com­ments from its pres­ident and one com­mencement speaker. Now, I agreed with much of what Frieder­sdorf wrote. His con­cerns about Pence were well-founded — Pence rou­tinely jus­tified Trump’s behavior on the cam­paign trail (and still does) and he endorsed a morally depraved man, Joe Arpaio, during a rally in Arizona. Both are ques­tionable and neither should be accepted without skep­ticism. But Pence’s short­comings don’t reflect on Hillsdale College just because he gave one speech on campus. I’d also argue, like Frieder­sdorf, that con­ser­vatism has no room for Trump’s pop­ulist policies and should not blindly accept them into the fold just because he was the lesser of two evils. This is an important dis­cussion regarding the school’s direction that we, as stu­dents, shouldn’t shy away from having. But since Frieder­sdorf also wel­comed any responses and dis­agree­ments from Hillsdale alumni, faculty, or stu­dents, I’m taking the bait. Mr. Frieder­sdorf, allow me to explain a few things about my school. First, Hillsdale College isn’t perfect and it’s never claimed to be. Inviting Pence was not a choice I sup­ported, but the growing affil­i­ation with the Trump admin­is­tration is not leading stu­dents astray from the prin­ciples Hillsdale’s mission clings to, as Frieder­sdorf sug­gests, albeit “mar­ginally.” The school’s staff strives to live what they teach and its stu­dents pursue truth just the same. That is true regardless of who sits in the Oval Office. Second, Hillsdale is not perfect because it is led by men and women who are far from perfect. As we’re taught in class, fallen human nature inevitably leads to flawed lead­ership, including Arnn. But a 10-minute con­ver­sation between Arnn and Hugh Hewitt is not enough for Frieder­sdorf to under­stand and dissect Arnn’s thinking. “The logic here is clear enough. Neither Hewitt nor Arnn talks as if they believe that good moral char­acter is really essential in an American pres­ident — they talk as if they believe that a pres­ident who fla­grantly exhibits all manner of char­acter flaws and odious behavior can put the country on a tra­jectory that ben­efits it greatly for decades if he appoints good judges,” Frieder­sdorf writes. That’s a bold claim. Unlike Frieder­sdorf, I don’t pretend to know the inner workings of Arnn’s mind, but I did spend a semester studying under Arnn, and one of the many sub­jects we covered while reading Aristotle’s “Nico­machean Ethics” was the mag­nan­imous man. This man, Aris­totle writes, is fit to rule because he pos­sesses what is great in every moral virtue. This man — the perfect ruler — has attained a greatness of soul to which the rest of us should aspire. Arnn’s con­viction and authen­ticity during that lesson seem to suggest a claim opposite of what Frieder­sdorf sug­gests. Arnn has not shied away from acknowl­edging Trump’s flaws, and he appears to support him for reasons he believes to be right. And though Frieder­sdorf admits Arnn “com­mends a more ide­al­istic, prin­cipled approach, in which good char­acter is at the core of good lead­ership,” he casts that in doubt because Arnn sup­ports a politician he doesn’t like. I agree with Frieder­sdorf, however, that since he’s vocally thrown his weight behind Trump, Arnn should engage with an apparent tension. After Pence’s speech, Hillsdale stu­dents, like myself, have ques­tions about the college’s ties to the admin­is­tration, and Arnn should be willing to speak to those in both a public and private setting. That con­ver­sation needs to be had and this is the perfect oppor­tunity to do so. Fur­thermore, Friedersdorf’s crit­i­cisms of Arnn open a huge can of worms. His argument centers on the idea that it’s wrong to support someone who’s per­sonally immoral, even if it’s for morally upright reasons. Fol­lowing that line of rea­soning, because Arnn sup­ports Trump, Arnn is morally vacant, and because Hillsdale stu­dents support Arnn, we, too, are defi­cient. See the problem there? No leader is perfect, so at some level we all support immoral people — not that we should do so blindly. I could argue that Friedersdorf’s leader, The Atlantic’s Editor-in-Chief Jeffrey Goldberg, made a poor, immoral choice to fire Kevin Williamson earlier this spring because of his con­ser­v­ative views on abortion, and that because Frieder­sdorf works and writes for him, Frieder­sdorf is also immoral. But I won’t, because that doesn’t make any sense. Frieder­sdorf is not Goldberg and Arnn is not Trump. I agree with Friedersdorf’s assertion that indi­viduals who care about upright living and the pursuit of truth shouldn’t rashly throw their alle­giance behind a leader defi­cient in both. But to put Arnn in that cat­egory is evi­dence that Frieder­sdorf doesn’t know him well enough. Arnn’s support for Trump is nuanced — he gives credit where credit is due and crit­i­cizes the pres­ident when need be, like many other prin­cipled con­ser­v­a­tives I know. Friedersdorf’s crit­icism was respectful and poignant, and it didn’t com­pletely miss the target. Yes, there’s a dis­so­nance between Arnn’s growing ties with a pres­ident riddled with moral short­comings and the values Hillsdale rep­re­sents, but it’s a stretch to argue this divide reveals an impending crisis that under­mines what the school stands for. The prin­ciples Hillsdale was founded on will remain and outlive the Trump era, with the college’s soul intact. So, to answer your question, Mr. Frieder­sdorf: Yes, you do have some­thing wrong. “His argument centers on the idea that it’s wrong to support someone who’s per­sonally immoral, even if it’s for morally upright reasons.” I was taught exactly that prin­ciple in Hillsdale’s religion program, albeit during the Clinton era. Perhaps now Hillsdale is more com­fortable with the argument that the ends justify the means? That would be very dis­ap­pointing in a school that lit­erally sold me the book against moral rel­a­tivism and sit­u­a­tional ethics (“Feet Firmly Planted Midair”). That you learned that in a religion program, assuming it’s Christian, does not seem probable. One needs look only at the Bible itself to see divinely ordained leaders who also happen to have an unhealthy pen­chant for women. Perhaps you mis­in­ter­preted a lesson. As for the ends jus­ti­fying the means – hardly. The prin­cipal that I imagine Dr. Arnn to espouse is that “means must be com­men­surate to the ends.” Is it not rea­sonable to suggest that one may kill in defense of his own life while simul­ta­ne­ously rec­og­nizing that one should not kill at a slight provo­cation against pride? I do not recall the Patri­archs being par­tic­u­larly repentant after they pros­ti­tuted their wives to ensure safe travels. Nor am I going to claim to know whether Mr. Trump is repentant. And neither should you. This all begs the question: at what level of vice does a can­didate become intol­erable? Pen­chants for women? Dis­honesty? Drugs? Drinking? Gluttony? Cor­ruption? Crudeness? JFK could not be sup­ported, nor could Obama, nor Nixon, W. Bush, Grant, Jef­ferson, Clinton, LBJ, Taft, TR, et al. Ted Cruz allegedly had an affair. And Marco Rubio is short. “…He that is without sin among you, let him first cast a stone at her.” Perhaps it should be, “…He that is without sin among you, cast your vote for him alone…” A new the­o­logical doc­trine: Sola Sancta! He, he! allow me to define a bit of repen­tance that doesn’t involve looking into someone’s soul: 1) pub­licly admitting that you were wrong 2) saying “I’m sorry 3) Not bragging about the wrong that you did. Whatever else you believe about Trump, his example is clearly bringing out the worst in the con­ser­v­a­tives — people are now arguing on a Hillsdale College affil­iated site that people shouldn’t be all that worried about the virtue of a person. They are also per­forming the classic “point at someone else who is per­ceived to be doing worse when you are con­fronted about your wrong” in volumes unheard of in the past. SAD! It might be “classic,” but it is cer­tainly worthy of con­sid­er­ation. I believe that there is a statue of Thomas Jef­ferson on Hillsdale’s campus. He was a phi­lan­derer. He was a slave owner. He died woe­fully in debt through his own intem­perance. He per­verted scripture with the cre­ation of his own Bible. There is no repen­tance of which I am aware. He also drafted the Dec­la­ration of Inde­pen­dence and served as an effective pres­ident of the United States. Though he himself might have been vicious, he was capable of con­necting prin­ciples with prudent action, which might be con­sidered the virtue of the statesman. He cer­tainly seems worthy of support. I will con­clude with that. it looks like you are a christian of some sort, in thinking that a book written by men in a par­ticular place and time can be “per­verted” as though it were holy cannon. Maybe you should con­sider some­thing that is in that book: 2 Corinthians 5:10 — it seems pretty clear that your rel­ative deeds com­pared with others won’t be given any weight. Your Thomas Jef­ferson example is a straw man because most of those mis­deeds you speak of weren’t known pop­u­larly or weren’t seen as bad. Also, his reli­gious views don’t count for or against him. Good article. I can under­stand Mr. Friedersdorf’s line of thinking, and as a Trump sup­porter I would dread seeing our college become fully tied to the current Pres­ident. It’s important to remember this: most Trump sup­porters (or at least the ones I know) do not support him because they think he is a good Christian role model. They support him because of his ability to nego­tiate with others and fulfill cam­paign promises. Many of them also sup­ported Rand Paul, Ron Paul, or Ben Carson for the pres­i­dency at some point. At its core Hillsdale is a school that teaches self-gov­ernment, and Arnn’s endorsement of Trump has not changed that. 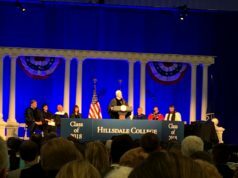 The fact that we can have dis­agree­ments and the fact that so many of us were opposed to Pence being the com­mencement speaker show that Hillsdale’s student body is not as blindly pro-Trump or pro-Pence as Mr. Frieder­sdorf seems to believe. We can all be self-gov­erning and appre­ciate the Great Books without agreeing polit­i­cally. Like him or not, Pres­ident Trump is keeping every promise he made on the cam­paign trail. What a refreshing change that is, espe­cially after 8 years of the most colossal Liar in the History of the Pres­i­dency. As for Frierdersdorf’s com­ments, why should anyone care what some Least-Coast Pro­gressive writer for the ‘Atlantic’ thinks about Pres­ident Trump or VP Pence? He probably gushed unceas­ingly during the vacuous years of the Obama Admin­is­tration and had absolutely no problems with Barack Obama giving a com­mencement address at Notre Dame Uni­versity-despite the latter’s avowed anti-Abortion position. Like most Left-Coasters he saw no wrong com­mitted during the eth­i­cally chal­lenged pre­vious Admin­is­tration. The west and east coat elites appar­ently didn’t learn the real lesson of the 2016 election-that average folks who inhabit the vast majority of the country have had it with the corrupt minions who use elected office to advance their own agenda. Frierdersdorf’s should tap that into his pipe and puff on it a bit, before boring Amer­icans with his political views, such as they are. Hear hear. I said it when the com­pletely wrong choice was made: Pence stands for every­thing Hillsdale College does not. But you know what? Pre­vious college admin­is­tra­tions have gotten things wrong, too. Do yourself a favor and look up the story about one college pres­ident who attempted to ban female stu­dents from poetry clubs. The student revolt was remarkable. The per­manent spirit of Hillsdale College has a ten­dency to correct tem­porary errors. While I under­stand you per­sonally may have been vocally critical of the college’s decision to invite Pence, it’s my under­standing some of your col­leagues were critical in writing… and the college had the article pulled. That’s truly dis­turbing. Can you say more about this? I have some per­sonal history of this hap­pening when I was there. and I heard about it hap­pening at other times in the past, but very little fact. About this or other times? On this one, it’s hard to prove a neg­ative, all I have is a staff member telling me it occurred. I believe them even though it never made it to print. On other articles, sure, things have been san­i­tized even after making it to print and it’s easy to find proof of this. One story was a few years back, on the Broad Street Market in which the student writer referred to patrons of another bar, (and I’m para­phrasing) “The lower bas­teons of society”. Obvi­ously that gen­erated alot of backlash from city res­i­dents. The web story was pulled, it’s no longer on the web version of the Col­legian. I have no doubts both the editor and perhaps the facility adviser regretted letting it go out, but it shouldn’t be pulled from the online paper once it makes it in print. Same thing occurred in ~2009 when the baseball team dec­o­rated the front porch of the Col­le­gians editor with road kill in retal­i­ation for a edi­torial critical of them. The online article got pulled shortly after the story went viral. That being said, despite the over­reaching hand of college admin­is­tration, I still think the Col­legian has pro­duced some top rate jour­nalists. At the end of the day, for better or worse, the Col­legian is a training tool. That articles might be pulled or sup­pressed is dis­ap­pointing, but not fully unex­pected. That the col­legian staff member told me about the Pence dissent in a pro­posed article, shows me that they care about the art. Thanks for reply. I have heard the same — and that the edi­torial side of the paper is reg­u­larly over­ruled from the admin or dean’s office — with a phone call — but without any real guidance about what is or what is not allowed. The result is that the reporters are somewhat gunshy about par­ticular topics because the phone call isn’t handled par­tic­u­larly pro­fes­sionally and the reporters/student editors (under­standably) seek to avoid this occur­rence. I think one of the issues with Hillsdale, which leads to Mr. Freidersdorf’s claims, is that Dr. Arnn does take a role which is much larger than nec­essary. 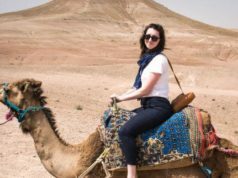 It is one thing to take a public role rep­re­senting the college with donors and leading internal events where parents, alumni, pro­fessors, and stu­dents are present. It is another to be pub­licly stumping for the college + political leaders on the cam­paign trail and in other public forums. This position leads to the wide­spread con­flation that Arnn = Hillsdale that the author of the original article per­ceived. In reality, it is likely that no one would have been entirely happy with the selection for grad­u­ation speaker. Pence was a big, attention-getting name. I just wish that in sit­u­a­tions like this Hillsdale would take the high road and publish the dis­cussion, let the world know that it wasn’t a unan­imous choice — use it as a tool to engage the inter­ested public (alumni, stu­dents, parents, pro­fessors). I don’t think that anyone would cry if it was wide­spread knowledge that the choice of Pence was for public pro­motion on some level. I think this is the true Hillsdale way and a method that yields ben­e­ficial results in the long run.